16 x 21,5 cm. 256 pages. 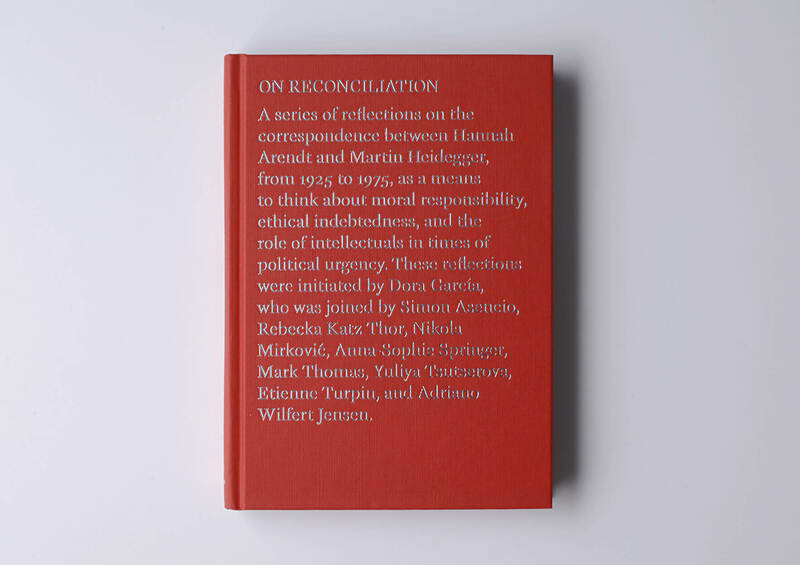 The bilingual publication On Reconciliation / Über Versöhnung uses the letters exchanged between Martin Heidegger and Hannah Arendt from 1925 and 1975 as a departure for a series of essays and conversations aiming to encourage a public debate on a difficult subject: the question of ethics and artistic production. In García’s view, Arendt not only formulated the concept of reconciliation to make bearable the world after the Second World War, but also to rationalize her unconditional loyalty to Heidegger (founded in youthful love) and her lifelong devotion to his oeuvre. Heidegger was a member of the Nazi party and (arguably) the most important philosopher of the twentieth century, while Arendt was an assimilated German Jew who fled Europe to escape the Holocaust, later becoming a moral referent, as well as an acclaimed social, historical, and political theorist. With contributions by Dora García, Simon Asencio, Adriano Wilfert Jensen, Nikola Mirkovic, Anna-Sophie Springer, Mark Thomas, Rebecka Katz Thor, Yuliya A. Tsutserova, and Etienne Turpin. Includes facsimile reproductions of selected letters between Hannah Arendt and Martin Heidegger. Design: Katharina Tauer. German translations: Herwig Engelmann. Published by K. Verlag in collaboration with the Gallery for Contemporary Art – E-WERK Freiburg and the Academy of Fine Art Oslo/Oslo National Academy of the Arts. Made possible with the kind support of the Oslo National Academy of the Arts.